Linda has a chance of a new life; and boy is she going to take it.After realizing she has lived her life being what everyone else wanted her to be, Linda knows she needs to change. Using her deceased husband's pension and insurance money, she heads to Fiji, to find herself and bumps into a very nice distraction. The story is not just about romance but of finding yourself in the murkiness of your own life. It is not easy to break old habits. 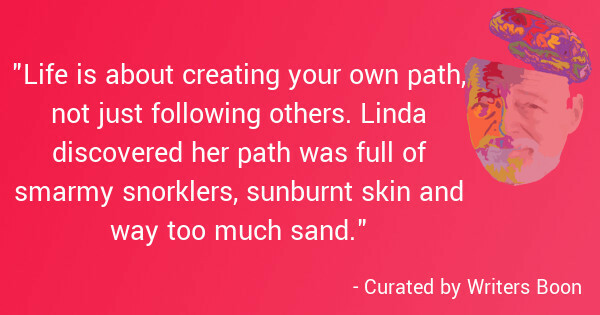 The author does an excellent job of writing Linda's struggles as she transforms into a new person. I'm glad the author slowly developed Linda's many stages of grief. She goes through anger, guilt, denial and a sense of loss in a mature way. The emotions were raw and exposed a side that many of us go through when facing new challenges. The book is a short read, but it is packed with laughter, tears and gives the readers a look at life and what their purpose may be.